The Beaufort Board of Commissioners voted unanimously to adopt a watershed restoration plan on Aug. 14 in an effort to reduce polluted stormwater runoff in the town. The plan highlights water quality impairments in the Town Creek, Taylor Creek and Davis Bay watersheds and proposes strategies to reduce the volume of stormwater runoff entering waterways. The Beaufort Stormwater Advisory Committee collaborated with the Eastern Carolina Council and the North Carolina Coastal Federation to develop the plan. Members of the Beaufort Stormwater Advisory Committee include the federation, the Eastern Carolina Council, the North Carolina Coastal Reserve & National Estuarine Research Reserve (NCNERR), town representatives and local residents, UNC Institute of Marine Sciences, N.C. Division of Energy, Mineral and Land Resources and more. The team has been working since 2016 to develop the plan. “We are very excited that the town’s commissioners recognize and appreciate the work our committee has done over the past year,” said Whitney Jenkins, coastal training program coordinator for NCNERR, who is the leader of the Beaufort Stormwater Advisory Committee. At the meeting, Jenkins, as well as Lauren Kolodij, deputy director for the federation, and Mariko Polk, GIS Watershed Specialist for the federation, presented the plan and what it would mean for the town. Polk gave an overview of the water quality in the watersheds, the process of developing the plan’s stormwater volume reduction targets and the plans goals and objectives. She said that an increase in impervious surface happens as a town develops, and because there is less soil to soak into, there is an increase in stormwater runoff that enters waterways. Kolodij discussed the success of watershed plans in other areas of the coast and gave examples of techniques that have proven effective. 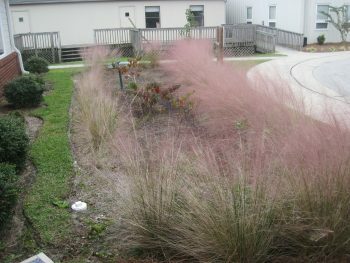 Some of these techniques can already be found in the town — a rain garden at Tiller School that the federation helped build, a rain garden at Lennoxville Road boat ramp, permeable pavement at the Beaufort Fire Department and various stormwater reduction measures on Pivers Island. She noted that many of these techniques can be incorporated right into the landscape. “It’s great to see that the town already has examples of many of the techniques that are suggested in the plan. Stormwater management strategies that infiltrate or treat stormwater throughout a site are much more effective than conventional systems that collect and pipe stormwater to ponds or ditches,” Kolodij said. Kolodij also explained that adopting a watershed restoration plan positions a town to apply for funding to install such projects. A perfect example of this is a $172,000 Section 319 grant recently secured by Swansboro to install stormwater reduction measures at their government complex. Swansboro’s Watershed Plan was just approved in February. Kolodij mentioned potential retrofit sites, including a park on Front Street where runoff is currently piped directly into Taylors Creek. By building an underground infiltration system, some of that runoff could be infiltrated by the soil before it is discharged into the water. Additionally, installing these techniques in public areas provides educational opportunities for community members and demonstrates techniques that can be used on individual yards. To learn more about how to reduce runoff at home, check out Smart Yards, a guide for simple do-it-yourself stormwater reduction projects. To learn more about watershed restoration planning, please visit this page. Please contact Lauren Kolodij at 252-393-8185 for more information about the Beaufort watershed restoration plan and to learn more about the federation’s work with coastal communities.